Suppose a motor connected to a 120 V source draws 10.0 A when it first starts. (a) What is its resistance? 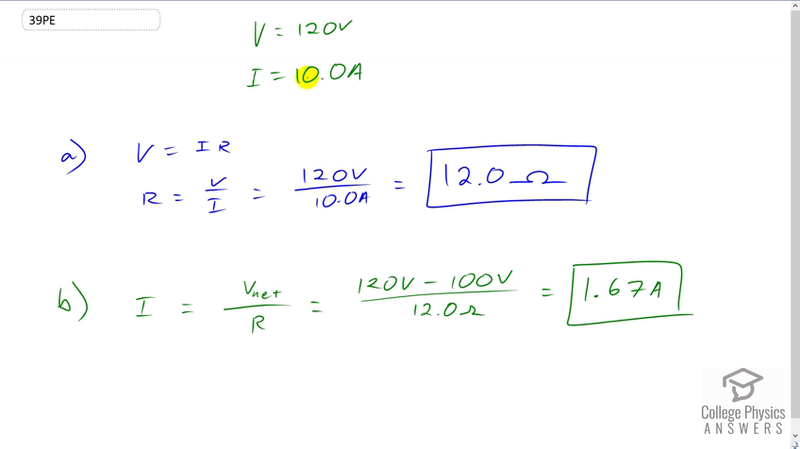 (b) What current does it draw at its normal operating speed when it develops a 100 V back emf? This is College Physics Answers with Shaun Dychko. An electric motor is connected to a 120 volts source and it draws ten amps of current when it's initially turned on. So, when it's initially turned on, that means it's not turning yet. And so, there's no back Emf, in which case the voltage is going to be the voltage of the source. That will be the net voltage. And, we'll divide both sides by I here to solve for R, and we get that the resistance in the armature of this motor is 120 volts divided by 10 amps, which is 12.0 ohms. In part B, we're told that after it gets up to speed, it has a back Emf of 100 volts. And so, in this case, the current then will be this net voltage 120 minus 100 volts of back Emf and that's going to be divided by the resistance we calculated in part A. And, the current should be 1.67 amps.